Floor Sample Testing on new and used floors in the UK, Europe and Worldwide - Prevent Slip Injury Claims in advance!! For prices starting from just (GBP) £147*, FloorSlip can Pendulum Test a wide range of new and used floor samples quickly and efficiently with a same day turn round if required of results (once samples are received / payment made). *‘Rough’ finish floors start from GBP £227. Testing of floor coverings in advance will ensure the floor surfaces will have the required anti-slip properties to prevent floor slips that might otherwise lead to a slip and fall accident injury and subsequent accident claim. Sample testing beforehand using the industry / HSE recognised Pendulum Testing Method conducted to BS standards (BS7976-2 and BS 13036-4) proves to floor specifiers, builders and architects that the customers desired floor is not only pleasing to the eye but also of a sufficient slip resistance to satisfy Health & Safety Regulations; and to avoid future prosecution for dangerous slippery floor surfaces. *‘Rough’ finish floors start from £227. FloorSlip can also conduct sample tests on used floors. We are typically asked to do this in slip injury claims where a floor has been replaced but samples of the original flooring are still available. Floorslip can also arrange ramp testing of safety footwear for a variety of reasons but principally for the ability to prevent floor slips. Footwear can not be controlled in public places and relies on a good slip resistance flooring specification at the outset. 2. To prove a shoe sole / heel combination for generic non-slip use; this is typically conducted using a rubber hardness of 55 on a range of floor types generally found in areas where non-slip is essential such as in a kitchen environment.. 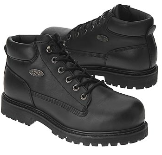 Both safety shoes AND non slip floors wear out. Therefore employers and managers duty of care should be to monitor both. Note also, even in good intent, the combination of one safety shoe type and a floor of a particular floor slip properties may not work effectively in conjunction with each other and this can be tested for.